We've searched for the best portable storage for you to transfer your data from place to place. While cloud storage solutions are handy, they can be limited by your connection to the Internet. Some good old fashioned external storage will always get the job done, and in fact, these days they’re not so old fashioned. You can get modern, portable solid state drives which are faster than ever before, and even USB drives and external hard drives are better than they used to be. Nearly every drive on this list is either ruggedly built, comes with secure encryption, or both, so your data will be protected from the elements and any potential thieves. Portable SSDs are very pricey, but for the money you won’t find anything faster in a portable device. The Samsung Portable SSD T3 is faster than any USB flash drive available (and any hard drive, of course) with a sequential read/write speed of 450 MB/s, and it’ll still fit nicely in your pocket. It’s basically a Samsung 850 Evo SSD, but smaller, and that’s an excellent pairing. The T3 measures 74 x 58 x 10.5 mm, weighs 51g, and despite its diminutive size, it’s shock resistant with an external metal body and internal support frame. Plus, despite being small and fast, you’ll still get a great deal of storage capacity out of it. The number of stacked layers of V-NAND flash memory cells have been increased from 32 in the T1 up to 48 in the T3, and Samsung has been able to double the storage capacity over the T1 model. You’ve got a choice of 250GB, 500GB, 1TB, and even 2TB options. You’ll be paying upwards of $740 for the largest T3, so only go for that if you really need it. We don’t know what kind of extreme conditions you face on your way to school. Whether they include freezing temperatures, underwater sections, or public transport, the LaCie XtremKey should be able to survive it all. This one’s a 128GB USB 3.0 drive which measures 0.1 x 2.9 x 0.9 inches, weighing 3 oz. There are also 64GB and 32GB versions available, although these days it’s usually more cost effective to go for higher capacities. 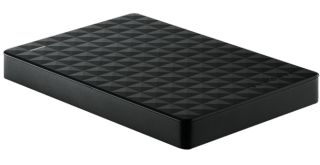 The XtremKey is pricey, especially as you can find 4TB of storage below for the same price, but there’s a reason behind the price. The XtremKey is small, but specifically designed to take all kinds of punishment. It can withstand temperatures from -50C to 200C, it’s waterproof up to 200m, and it’s shock, pressure, and drop resistant. This is all thanks to the 2mm Zamac alloy casing which is sealed with water-resistant screw threads and a hermetic, rubber O-ring. It’s not just protected against the elements either, as the XtremKey features AES 256-bit encryption which will keep your files safe. If you simply want a lot of no-nonsense storage, Seagate has some good options for you. For just over $100, you can get 4TB of storage, and while it’s not super speedy, it’s still good value for money. You can even go all the way up to 8TB if you want. Measuring 20.9 x 80 x 117 mm and weighing 238g, it is bigger and heavier than a lot of the other drives on this list, but that’s still a manageable and portable size. All you have to do is plug in the USB cable and you’re set. There’s no software, no external power needed. The Seagate Expansion external hard drive is a simple way of transporting a lot of files from place to place. If you’re looking for speed however, you will probably want to look elsewhere. The Western Digital My Passport Ultra has a bit more style to it than a lot of other portable drives, which might be important to you. The drive itself has a handful of colors to choose from, plus WD puts out Grip Packs which can add even more colors to the outside. It’s not all about the looks though, as this is a fairly speedy external drive which comes in 500GB, 1TB, 1.5TB, 2TB, 3TB, and even a 4TB model. The My Passport Ultra measures 110 x 81.5 x 12.7 mm, and weighs 153 grams, so it’s nice and light, and will fit in your pocket for easy transportation. Plus, it comes with WD Backup, WD Security, and WD Utilities applications installed, allowing you to select which files to backup periodically, protect your files with 256-AES hardware encryption, as well as letting you check the drive’s status and reformat easily. There’s also a metal edition if you want a bit more style for your drive, and while WD says it’s “performance tuned,” there’s not much difference between the two. The Seagate Wireless Plus isn’t the fastest external hard drive on this list, nor does it have the most capacity, nor is it the cheapest. But it is wireless, and that can be pretty handy if you want to access files from it on multiple devices. An alternative option in the wireless market could be the Fuel from Seagate-owned LaCie, but it’s a little bigger, and a little slower. This one is 127 x 89 x 20 mm, weighs 254g, and comes in 500GB, 1TB, and 2TB models. It connects via WiFi, and can share an Internet connection with up to seven devices, and share content with up to eight devices within 40 meters. The main problem here is that the Wireless Plus will require charging, and it can take nine hours if it’s simply connected by USB. Plus, you might find the price pretty scary compared to some of the drives on this list. This one’s an option if you’ve got the cash to spare, and if you’ve got an actual use for it. If the security of your data is a concern, the Buffalo MiniStation Extreme NFC has 256-bit AES encryption and hardware based Near-Field Communication technology. Once you’ve set up the encryption, you have to touch the NFC card to the drive to get at your data, or use a password if you don’t have the card. You have the option of a 1TB or 2TB version, and while that’s not the most storage on this list, it’ll probably be enough for most people. It measures 3.54 x 5.55 x 0.83 inches, and weighs 11oz, which is about average for this kind of drive. It’s pretty rugged too, as well as being water and dust resistant, and it has the USB cable built-in, which is always handy. If you need a lot of storage space, and you need it to be super secure, then you might want to take a look at the Apricorn Aegis Padlock DT FIPS. This external hard drive goes all the way up to 8TB of storage, and comes with 256-bit AES encryption, like many other drives on the list. This one has the added bonus of a keypad which unlocks the data, which makes it look like whatever you’re carrying around is really important, even if it’s just a slideshow of cat pictures. It’s worth bearing in mind that this comes with a price, literally and figuratively. You’ll be spending hundreds and hundreds to get the most storage here, and even the smallest 1TB version costs nearly $200. Also, it’s big and bulky. The solid aluminum casing weighs 2.5 pounds, and it measures 1.5 x 4.5 x 7.2 inches, so this isn’t something you’ll be carrying around in your pocket. If you just want a small USB drive with plenty of storage, you can’t go wrong with the Patriot Supersonic Mega. It comes in 128GB, 256GB, and 512GB capacities, measures just 0.4 x 1.1 x 2.8 inches and weighs a tiny 0.8 ounces, which is about what you’d expect. It’s pretty speedy too, with Patriot saying it reaches up to 70 MB/s write speed and 380 MB/s read speed. For that speed and the storage space, the Patriot Supersonic Mega is quite reasonably priced as well, although you will be paying $150 for the 512GB version, when the same price will give you a lot more storage on a normal external drive. You’re paying for the size and ease of use here, and on top of that it looks quite stylish and is shock resistant. The LaCie Rugged Thunderbolt is a speedy, yet rugged portable solid state drive with USB 3.0 and Thunderbolt interfaces. The Thunderbolt cable is permanently attached, which you can remove the USB cable if you wish, plus you can cover up the ports when you’re not using them for added style and protection. It comes in 1TB, 2TB, and 4TB models, so it should have you covered no matter what your storage requirements. It measures 1 x 3.5 x 5.5 inches, so it’s fairly small, and it weighs 12 ounces, so you’ll be able to transport it around easily. It looks pretty nice too, if a little ostentatious, with its orange rubber casing which also makes it shock resistant to drops of up to five feet. It’s water and dust resistant, and comes with the fairly standard AES 256-bit encryption. This version delivers up to 378 MB/s read speed, and there’s a hard drive version too which offers 122 MB/s.